In September, the Fort Nelson First Nation won a major legal challenge at the Environmental Appeal Board (EAB) that overturned a long term water license issued to gas giant Nexen Inc for hydraulic fracturing (or “fracking”). The EAB decision is an important win – setting new precedents on how water managers should deal with scientific uncertainty and the government’s obligations to consult First Nations on water use. However, the decision did not answer the question of how the “cumulative impacts” of oil and gas development should be addressed - a key concern of the Fort Nelson First Nation. With about 800 members, the Fort Nelson First Nation (FNFN) is situated in the far northeastern corner of the province, right on top of BC’s largest gas deposit. Extensive oil and gas development in the area is compromising the integrity of ecosystems and threatening FNFN’s way of life (see this video). Lana Lowe, Director of the FNFN Lands Department, sums it up: “access roads carve through our forests, gravel pits ruin our traplines, pipelines denude our streams, and wells foul our waters” (EDRF Application January 2013). In May of 2012 the BC Government granted a water licence to Nexen allowing withdrawal of up to 2.5 million m3 of water (up to 14% of the annual discharge on the Tsea River system) annually from North Tsea Lake. The water was to be used for fracking - a process in which water is pumped, under high pressure with chemicals and sand, into gas wells in order to shatter the rock and release further gas. The process is contentious, with fears that it can contaminate lakes and rivers (EDRF Application January 2013). Nexen’s license allowed more than double the water storage that company operations required, without any cumulative effects analysis of total withdrawals on the watershed. FNFN approached West Coast Environmental Law for help with, and received a grant for, the costs of its appeal of Nexen’s water licence in 2013. FNFN argued that allowing Nexen to withdraw huge amounts of water would negatively impact riparian ecosystems and wildlife. They called a team of expert witnesses to challenge the lack of science behind the license approval. The Environmental Appeal Board overturned Nexen’s licence, siding with FNFN on a number of key issues. Given the uncertainty involved in estimating stream flows and attempting to predict the potential impacts of a licence on the aquatic and riparian environment, a manager should take a conservative or cautious approach to making licensing decisions and setting conditions in a licence. We might suggest that this common sense approach looks a bit like an application of the precautionary principle, but we won’t because earlier in the same decision the EAB rejects the idea that water managers should apply the precautionary principle. But regardless, we’re glad that the EAB agrees that a cautious approach is needed. The reliability of the NEWT model is only well known when predicting flows in basins from which the data was developed. The evidence is inconclusive as to the degree of uncertainty in the NEWT results for basins outside of the data set. This is not to say that NEWT is not useful, but at this time there is no way of knowing the accuracy of results generated by NEWT. The Panel concludes that NEWT is a helpful administrative tool when making water allocation decisions. However, NEWT should not be relied upon as the primary tool for estimating hydrologic characteristics at a point of interest, such as estimating the annual long-term discharge for the Tsea River at North Tsea Lake. This is an important finding that may well have an impact on the regulation of hydraulic fracturing and other water use in the Northeast. In addition, the EAB found that the Crown had been dismissive of the potential impacts of the licence on the rights of the Fort Nelson First Nation, and as a result had failed to meet its obligation to meaningfully consult the Nation. Internal emails suggested that officials were going through the motions of meeting with FNFN, rather than actually engaging the Nation. FNFN also argued, and the EAB concurred, that maximum withdrawal amounts should be based on actual needs. The news was not all good for FNFN, however. Given the deep footprint of industry in their territory, the FNFN wanted to establish that the cumulative environmental effects of all withdrawals and the activities that would result from those water withdrawals (notably more extensive hydraulic fracturing by the oil and gas industry) should be considered when water withdrawals are authorized. [T]he Panel finds that there is no basis under the Water Act for a manager, in assessing a water licence application, to consider the broad cumulative environmental effects of oil and gas developments, such as roads, gas pipelines and gas wells, in the watershed. Though it took twenty months to hand down the decision, Nexen will no longer be able to store further water under this license. 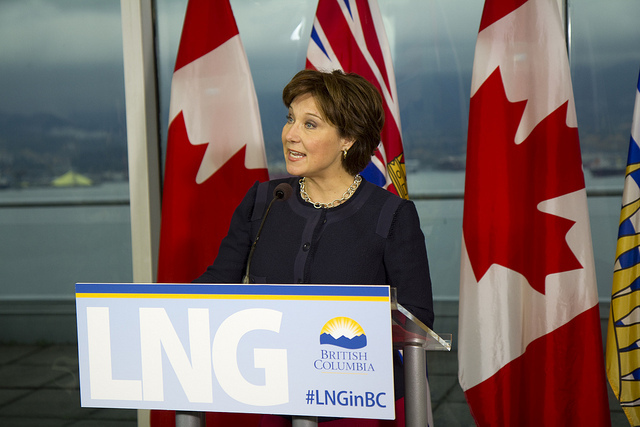 The decision is a significant victory in pushing for better management of LNG projects in BC, although there are clearly ongoing concerns. On behalf of Fort Nelson First Nation, Lana Lowe says: “We are very grateful for the support of WCEL over the years!” We at West Coast are grateful that FNFN has been protecting their homelands and insisting on more responsible oil and gas development.